This post is mega special. but this gig wouldn't even be happening if house in the sand . com didn't exist. So we're bringing it home by sharing the news here as well. So yeah, we're hosting a gig. Even typing it feels insane. If you remember, this year we didn't host our annual Birthday Countdown. I (Vanessa) was already knee-deep in researching this matter. because that's just how we do things over here. And I mean... we pulled it off. But, we've got the venue, we've got the date, the artists, we've got the crew and so now all we need is the audience. And we were kinda hoping you could help us out with that. We would like to invite YOU to our first ever house in the sand gig. We're using this as a late birthday party since we didn't celebrate properly in February. which means that we will be asking for donations. Schedule: We advice you to be there before 8pm (20:00 Uhr) to get comfortable. We'll be starting between 8pm and 8:30pm with the first act. please let us know if you're coming to the show by selecting "going" in our Facebook event. He's been a part of HITS ever since his days in The Arkanes. Remember the band? I'm sure you do. We didn't stop talking about them. Over the years, Dylan has always been involved in our activities and to have him fly in from Liverpool just to play the show means a lot to us. It also shows that we found the coolest friends in the world. Dylan will be playing his solo music which is going to be an absolute treat. This will be his first solo show in Germany and we're damn sure it's going to be a blast! Josh made his house in the sand debut in 2015 and has not been able to escape ever since. He introduced us to living room shows and safely navigated us through London and onto boats. Jokes aside, we're thrilled that Josh moved to Berlin and also decided to join our show. You can expect thoughtful songs that vary from soothing, to hopeful, to heartbreaking. We'll definitely be singing along to his tracks and can't wait for you to hear his songs. house in the sand wouldn't exist without Martin and James' track "Wrong Directions". We think it is. And to have Martin come down and play his music for us just sums up what kind of crazy rollercoaster of opportunities this is. Most of you probably already know and love his music. In case you don't, come down and be blown away. We'll be in there corner, crying happy tears. 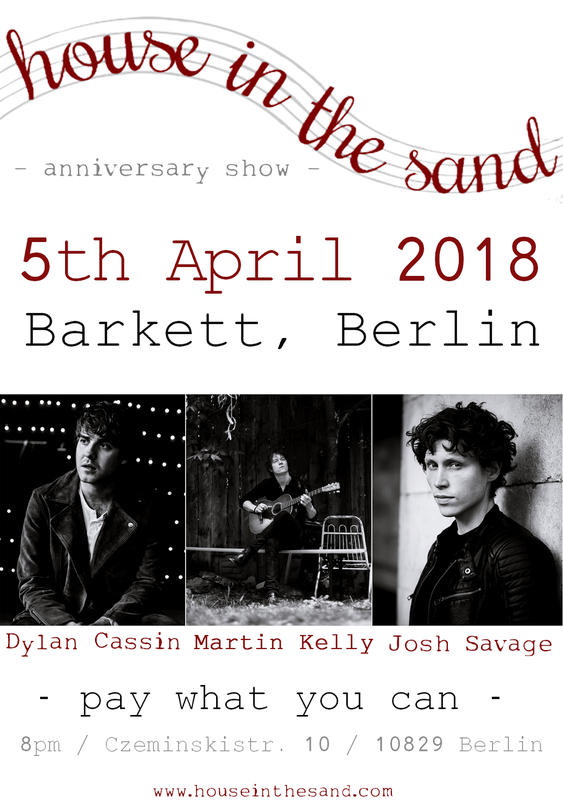 To sum this up for you, we've got some of the finest musicians on board and we cannot wait to celebrate the evening in Berlin. If you can make it, we would LOVE to see you there and have chats with you. We need your support with this and hope we can count on you. I'll hopefully see you on April 5th. Until then, thank you for letting us do this.